I want to especially invite you to attend the upcoming international dinner for international faculty and students because you have attended in the past and I know you are familiar with this event. We want to encourage you to invite the students in the Asian Studies Program and other international students and colleagues to attend. Once again, we are looking forward to seeing you! 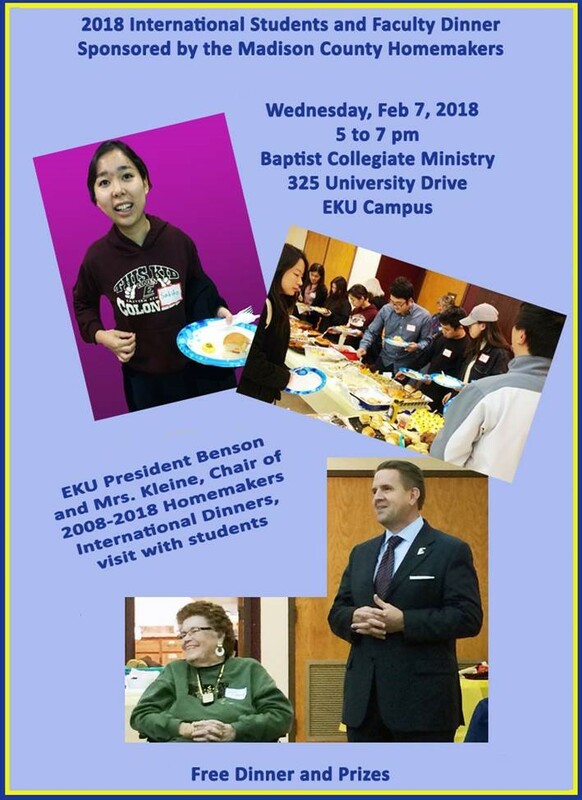 Eastern Kentucky University (EKU) international students, faculty and staff will participate in a dinner sponsored by the Madison County Extension Homemakers from 5 to 7 pm on Wednesday, February 7. This 29th Annual International Dinner to be held at the Baptist Collegiate Ministry at 325 University Drive next to the EKU campus. Special guests attending the 2017 International Homemakers Dinner included Dr. Michael Benson, President of EKU; Wenceslaus P’Oryem, Director of the EKU International Student and Scholar Services; Jennifer White, Education Abroad Administrator, and Gina Noe, Extension Agent for the Madison County Extension Service. Noe said, the International focus of the Extension Homemakers has a two-fold purpose. She said it is to welcome international students to Madison County and it is an opportunity for homemakers to meet international students and faculty to learn about their cultures. Students, faculty and staff from 20 countries attended the 2017 International Dinner. They were from: China, Columbia, Ethiopia, Germany, Guatemala, India, Iran, Japan, Korea, Mexico, Netherlands, Pakistan, Panama, Puerto Rico, Saudi Arabia, South Sudan, Spain, Turkey, USA, and Venezuela.